We love NECA. The company makes amazing toys that are worth buying even if you're not a fan of the properties they're based on. But their timing leaves something to be desired. When Assassin's Creed: Brotherhood came out, they released their Assassin's Creed II figures; now Assassin's Creed: Revelations is out, and we're getting toys from Brotherhood. I have always fought alone. But one man cannot defeat the entire Templar Order. So I have recruited my fellow assassins. Together, we will cleanse the corruption from the holy city of Rome. Together, we will forge the Brotherhood. In game terms, Assassin's Creed: Brotherhood was basically "Assassin's Creed 2½" - like Yahtzee said, it feels like the final bit of AC2 was lopped off and put into its own game as an excuse to get full price for an online multiplayer version. Not that that really matters much to any of us, since only Shocka has even played AC1 yet: like we said above, NECA's toys transcend their origins. 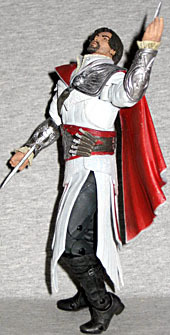 This figure is one of two Toys Я Us-exclusive variants, both featuring Ezio without the large hood obscuring his face. NECA has always fully sculpted the heads beneath the AC figures' hoods, but this is the first time we've ever really gotten to see it. 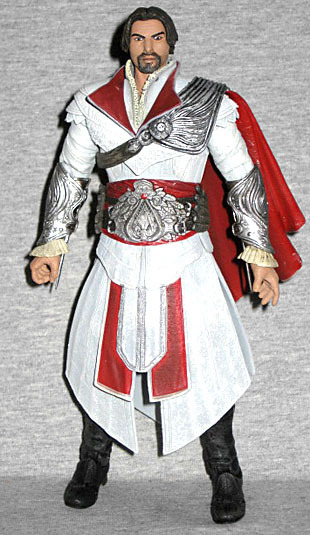 The face is based on French-Canadian model Francisco Randez, who has been the basis for both Altair and all three versions of Ezio Auditore da Firenze (which translates as Ezio the Loud Furnace). [No it doesn't. --ed.] 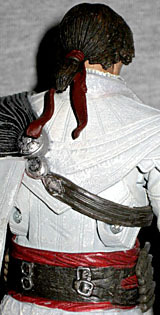 The figure has a slightly flat, crooked nose, which is accurate, and he has a sculpted beard and stubble. His hair is pulled back in a ponytail tied with a ribbon, which isn't something you'll see on the other Ezios. The first Assassin's Creed very quickly made the white robes an iconic look, so the subsequent games have stuck with it. 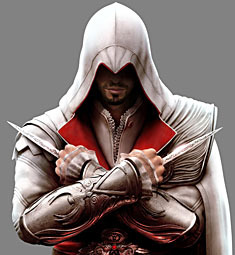 A bit of research suggests that the outfit Ezio is wearing doesn't actually appear in AC Brotherhood, but is instead based on promotional artwork. The main giveaways? He's wearing two identical bracers, which you can't manage in the game, and he only has the left pauldron from one of the game's armors (the "Suesenshofer," apparently) rather than the complete set. But again, that doesn't matter, because it passes the squint test and it's all handled very well. 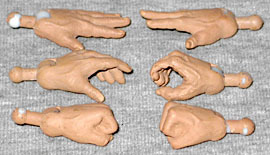 The figure was sculpted by Neobauhaus Studios, a company NECA has contracted to before. Neobauhaus is Djordje Djokovic, "sculptor/designer/all-around-awesome-guy" (as the Four Horseman describe him). We don't know whether this came from digital renders or was done completely by hand, but man does it look nice! There are wrinkles on his upper arms, and around his hips if you look under the robes. His (leather) boots and his (cloth) robes appear to have the same texture, but that's not something you'll notice unless you're getting very picky like we are. The cloth appears to pucker near the seams where it would have been sewed together. There is fine filigree embroidery on the edge of his shawl, a bit of a ruff along his collar, and lace cuffs. Fancy! The costume is designed to be multi-layered, and it's fabricated the same way: multiple pieces laying over each other. The pauldron and cape are a separate piece glued firmly onto the shawl over his shoulders, which then fits down onto the figure. His belt, the lower edge of his shirt and hanging ends of his sash sit above the lower half of the robe, which is apart from the legs beneath it. Even among these pieces there are distinct layers sculpted overlapping one another, adding more depth. There are exposed screws on the figure's back, which is very unusual for a modern figure. 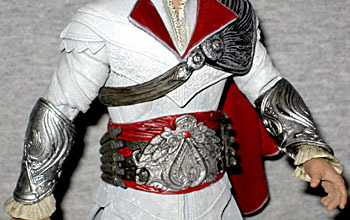 The armor on Ezio's waist is large and ornate. The Assassin's Guild symbol is in the center, surrounded by a complex pattern of leaves or feathers. 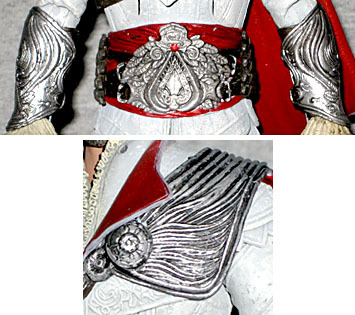 His bracers have the symbol as well, with wings coming out the sides and a bird sitting upon the upper point ("Ezio" comes from the Greek word for "eagle," just as "Altair" came from the Arabic for the same). His single pauldron also has a wing motif to it, or maybe flames. It's hard to tell in plain silver. Ezio comes with no weapons. He has knives on his belt, but they're not removable - the best we get are the extendable blades in both bracers (which, to be fair, is more than the last go-round of Ezios had). He has three pairs of hands - fists, clutching/relaxed, and splayed - and we realize that something had to be cut to make these toys come in under budget, but Ezio is a killer and he needs tools to kill with. While the accessories may be underwhelming, the articulation is outstanding. Just as the last Ezio improved upon Altair, so this Ezio improves upon that. He has a balljointed head, balljointed neck, lateral hinge shoulders (hidden by the shawl), swivel/hinge shoulders, swivel biceps, swivel/hinge elbows, balljointed wrists (to facilitate swapping them out, but they function more like swivels), hinged wrists, hinged torso, swivel waist, swivel/hinge hips, swivel thighs, double-hinged knees, swivel boots, hinged and rocker ankles, and hinged toes. Wow! What an assortment! Now, not everything is perfect. The only reason I know there's a neck balljoint is because the neck was twisted to the side, and I realized there was a joint when examining it: at first it only moved side-to-side and refused to turn, so I had to pop the head off and get in there with pliers to get it moving; but even after twisting it 360° nothing broke, so we're confident in calling it a balljoint. The shoulder hinges and the hips can be tough to move at first, but the clothes don't impede them at all, so that's nice. The fleshtone paint is scraping off the wrist hinges, but they're usually tucked away inside his sleeves where you won't notice. Due to the design of his bracers, the elbows can only bend about 30° unless you turn the inside of the arm to face up, at which point it will almost go to 70°. Really wish there'd been a way to make double-hinged elbows work, but overall, this is a great toy. The only thing that makes his TRU exclusive different from the mass release is the lack of a hood - it's why he was nominated for Best Exclusive. Just like the regular figure, he's also available in an ebony version that has several unique parts and also comes with a sword. Yes, that one gets a sword, but no extra hands, so it's a tradeoff. I chose this one because, come on, white robes are the trademark of the series, but it's really a toss-up: get whichever one you like best. Unless you plan to get both, of course. 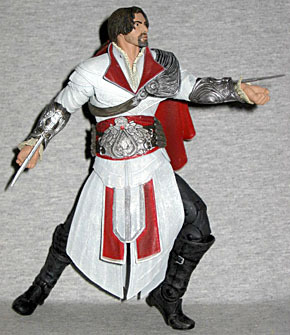 Ezio is a superb toy, the best Assassin's Creed figure yet produced. Now if only we could get some of the other characters from Brotherhood to round out his crew.